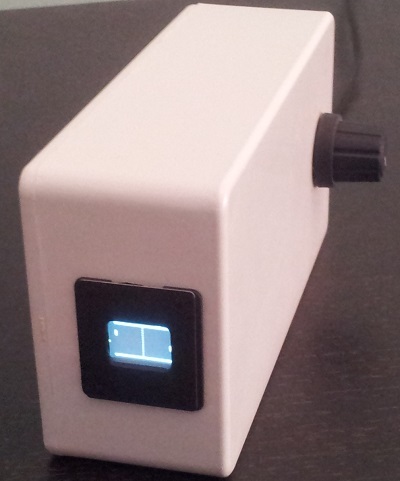 In early 2009, a friend and I saw a circuit on the Internet for a game called µPONG. 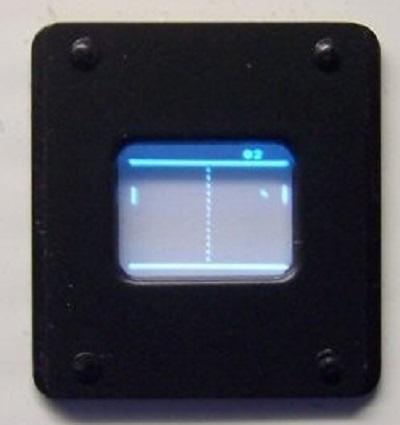 (micro pong) It used a small 8 pin micro (PIC) chip and a few resistors, etc to emulate the old Pong game from the ’80s. Anyway, my friend built his version into a small box and it connects to the A/V input on a TV. I didn’t get around to making one at the time, but had an idea for the same circuit matched up with a suitably small screen. Time went on and I still hadn’t gotten to it yet. When I received an invitation to a pinball meet later that year, I thought I’d better bring something along so I spent a few hours making this unit. I modified the micro firmware (program) a little to make it easier to play. The screen is a miniature B&W CRT from a camcorder. It has a viewing area of 12mm x 9mm – classic 4:3 aspect ratio! Luckily it ran from 5 Volts, the same as the micro running the Pong game. I managed to shoehorn the CRT, it’s miniature “chassis” and a small piece of Veroboard with the micro on it into a plastic case. 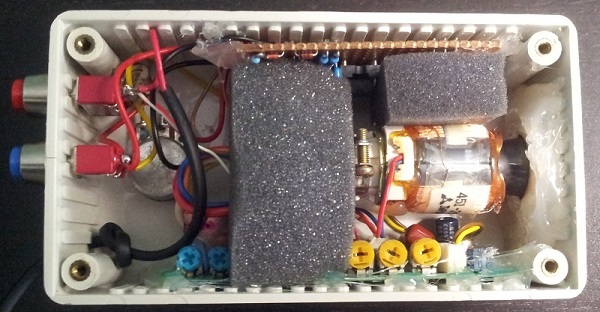 An old mobile phone charger (4.9V) was used to power it. It’s a one player game (against the micro) and I’ve never managed to score a point against it yet. I took the game to the pinball meet and got some nice compliments. At first nobody realised it really was a CRT and the game was in fact real! Obviously designed for right handed people! 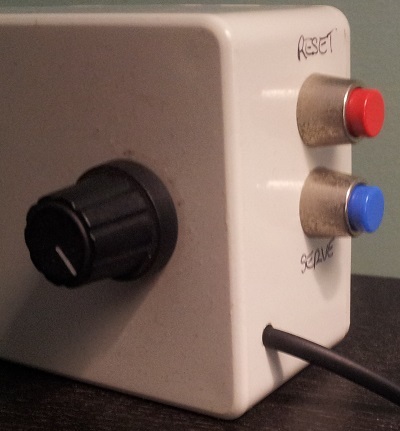 The CRT mounts to the end of the enclosure. Getting a in-focus closeup of the screen is difficult. There are three controls; the player bat position pot, a serve button and a reset button (to start new game). The insides are an interesting mess of boards, wiring, hot melt glue and some foam to protect the viewfinder CRT.